Let's talk about my sister for a minute. She is the busy wife of my cool bro-in-law, mom of my adorable niece and a practicing social worker. She, like many, struggles with getting meals on the table that are easy, healthy and tasty. She works all day, hasn't had a ton of culinary experience and, let's face it, she's tired!!! 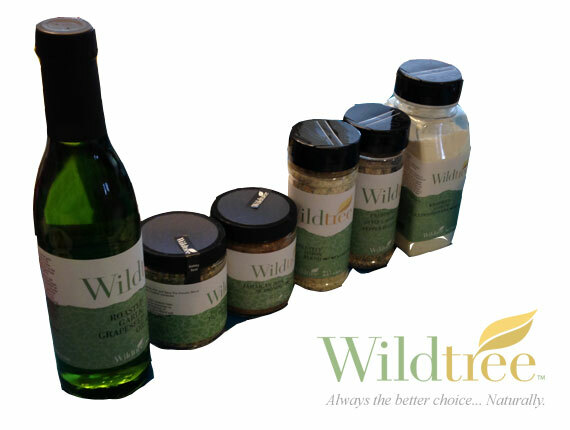 This is where Holly from Wildtree comes in! Our friend, Heather, suggested that we try a freezer meal class to help Allison (and us) get some meals stocked in our freezers. We decided to go with the crockpot class because the idea is that they are completely prepared, you just throw (okay, place) them into your crockpot, set it and forget it until you are ready to eat! The classes are even held at your house so it's super convenient! 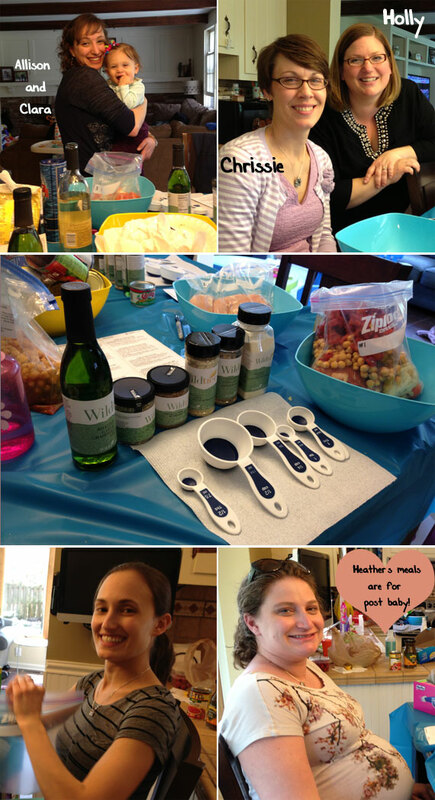 Five of us gathered at my house this past Saturday, bags in hand, ready to prepare! Holly set up a great display of the spices we ordered and we got to work. She was super friendly and patient (I couldn't seem to remember how many tablespoons of this spice or that) and we ended up with TEN amazing smelling meals in our freezers. I cannot wait to try them! I would have sooner but we may have ordered a few too many sandwiches for Simon's birthday and we are currently drowning in those. If you live in South Jersey/Philly area I'd check out her page. If you aren't I'm sure she could direct you to a Wildtree person in your area! Crayons and paper, paper and crayons! All Maya wants to do right now is color. She wants to do it before she goes to be, during breakfast, ALL THE TIME! I think it's great so I decided to mix it up a bit! Since my craft supplies are now organized (thanks to help from Mandi!) I can now easily find all of the supplies for the project. Magazines that I saved for the kids to use for collages, glue sticks that had never even been open and all the kid scissors, even ones that are Simon friendly! I had the kids find pictures to cut out and glue onto their construction paper. Simon got stuck on trying to cut and then ended up coloring with the glue! Maya, on the other hand, was into it! 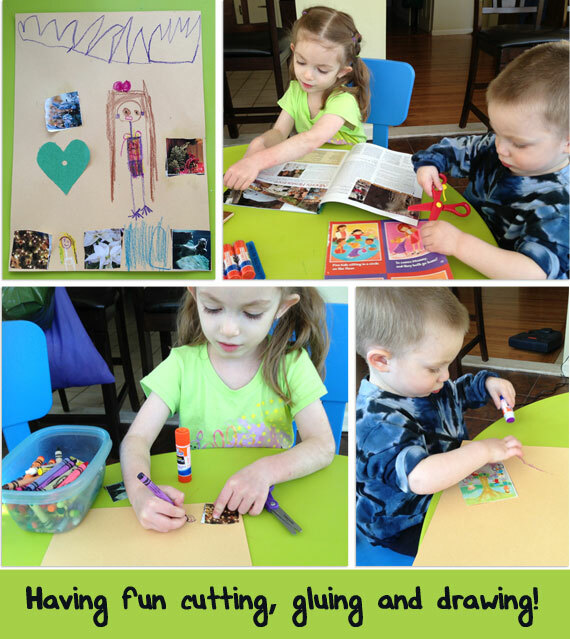 She carefully chose and cut out the pictures, glued them on and created her masterpiece! What do you get for the kid that has everything? Kids (mine included) these days have so many toys. It's crazy. It is difficult to figure out what to get them, something that they or their siblings don't already have. 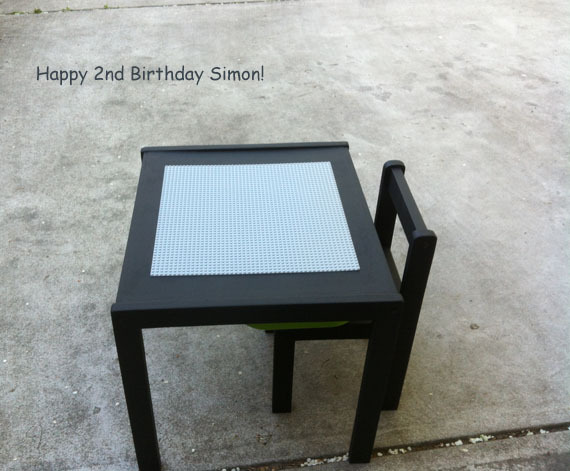 I solved this problem by making something for Simon on his birthday. I had pinned this awhile ago, and Sarah and I thought Simon would love it. Sarah had an old table that they weren't using and gave it to me (thank you) to use for the project. I had Trofast rails (Ikea) left over from when we built our Trofast Toy Storage System. All I needed was Loctite Stick and Seal Glue, chalkboard paint, Trofast bin, and two pieces of 1 x 2 inch wood cut to 17.5 inches. With a medium grit sanding block, I sanded the entire table and chair. First, I used a brush to paint all of the edges and corners--anywhere that would be hard to paint with a roller. Next, with a smooth finish roller, I painted the table and chair. As you can see from the picture I did this outside when it was sunny. This was a BAD, terrible, no-good idea. The paint dried so fast there was no way to go over any drips or imperfect areas. Which is impossible, so I ended up with a rough texture after the first coat. So I got out my sanding blocks out and I SANDED, sanded, and sanded again. Then I painted another coat of paint also outside in the sun. This is because I didn't realize that the rough texture was due to the very fast dry time in the sun. So I had the same rough surface result. I got out the sanding blocks again and I SANDED, sanded and sanded some more. I dreamed about what it would have been like if I would have just bought the Lack table when I was at Ikea. I contemplated going back and getting one. Then I sanded some more until all of the surfaces were smooth. After a conversation with some nice guys at the paint department at my local Lowes, I left the table and chair in my garage where it was nice and cool and I quickly painted the table and chair. I fixed any drips that I saw and then I walked away. Here are some things to keep in mind when painting. Change your clothes. No matter how careful you are you will get paint on your clothing, which will be ruined, and you will be mad. I repeat: change your clothes! Put the item that you are painting on top of something. I like to use bricks or boxes. This allows you to paint all the way to the bottom of the legs. Always start with a brush. Brush any areas that will be hard to reach with the roller. Chalkboard paint is very thick and it does dry fast. It is black which accelerates the dry time when put in the sun. Also, if you need to sand a rough surface you need to start with a coarse sanding block, then a medium one, and at last a fine. This will help get the surface back to smooth. The Lack table from Ikea (that they used in the post where I got the idea from) is flat on the bottom. Sarah's table not so much. I was not going to let this table win, so I had to figure out a way to build up the bottom so the rails were lower than the sides of the table, otherwise the drawer would not be able to be opened. This is where the 1 x 2's came in to play. I got the wood at Lowes and while I was there, I had the pieces cut so they would fit inside the bottom of the table. 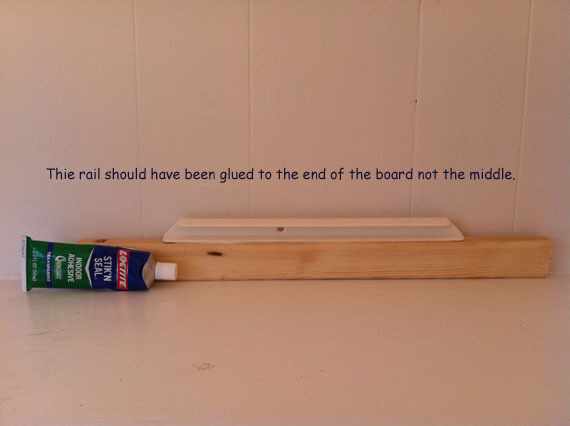 I glued the rails to the wood. For some reason I glued them to the middle of the wood. This would have made the drawer fall onto the floor when opened. So I used a hand saw and cut the ends off on one side of both of the pieces of wood so that the rails would line up with the edge of the table. Then I used the drawer to measure where the wood needed to be glued underneath the table. Then I glued them down. First I used a measuring tape to measure where to place the base plate. Next I spread glue on the bottom of the base plate. I didn't put the glue all the way to the edges so that it wouldn't squeeze out the sides when I pressed down the base plate to the top of the table. I was with my family in Disney World a few years ago when I accidentally bumped into a woman on the transport bus. I am not the tallest person there is and I happened to notice her necklace. She had two tiny little picture frames filled with her kids' pictures. I loved the idea of them and they were adorable. I asked the woman about her necklace and did some research; the necklace she had would run me almost $600!! As a bargain hunter I set out to find something similar that would be more reasonably priced. Through Etsy I found Kathy Lo Custom Jewelery and I was able to get exactly what I was looking for under $100! I ordered two "Mini Square" charms. They are 1/4" squares (smaller than a dime) and they have two sides to customize on each charm. One huge plus is that they are completely waterproof, I don't take mine off! My kids love looking at them and seeing their pictures and I love knowing that I carry a little reminder of them with me at all times! 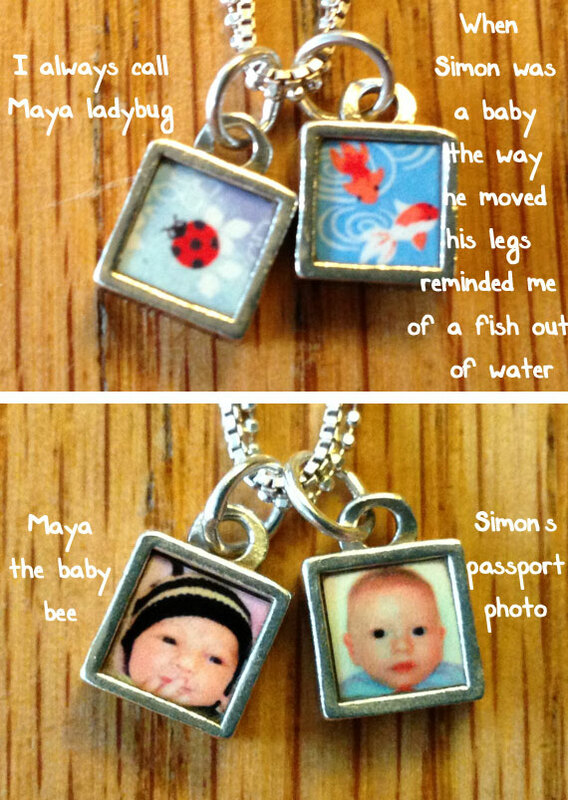 Kathy Lo Rocks Keepsakes has plenty of other customizable jewelery as well; bigger charms, charms compatible with Pandora type jewelery and even guy friendly items. 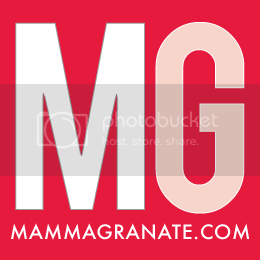 They make great gifts for yourselves and others (HINT - Mothers' Day is around the corner)! Just ask my sister, she got one as a birthday gift! I am always trying to teach my kids how to take care of the Earth. I also try to model the behaviors that I want them to do. It never occurred to me to talk them about Earth Day because I feel like we celebrate Earth Day everyday in our house. Anna asked me today, "Do we celebrate Earth Day"? She is very curious about who celebrates what holidays because she goes to a religious preschool and not all of the children that go there practice that religion. 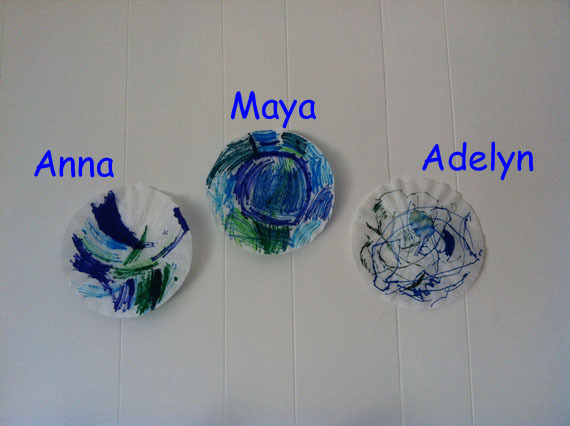 Anyway, I thought this was funny, and I decided to do this belated Earth Day Craft with her and Maya and Adelyn (who just learned how to spell her own name, it's so cute!). I got the idea for this craft at Anna's school. Miss Joan (www.missjoan.com) the teacher (who always does fabulous crafts) did it with their class and I saw it hanging in the hallway. 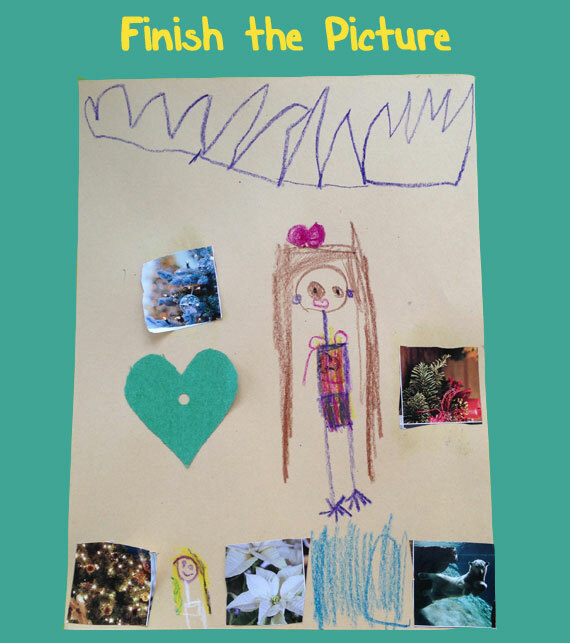 While we did the craft, we discussed different ways we can preserve the earth. I gave each kid a coffee filter and blue and green markers and let them color it as they liked. After they were finished I ran a little water over their coffee filters to make the colors bleed together. While they were drying, I gave each kid a piece of blue construction paper, a Q-tip, and a tea light holder with glue. I instructed them to paint dots on the outside edge of their paper. 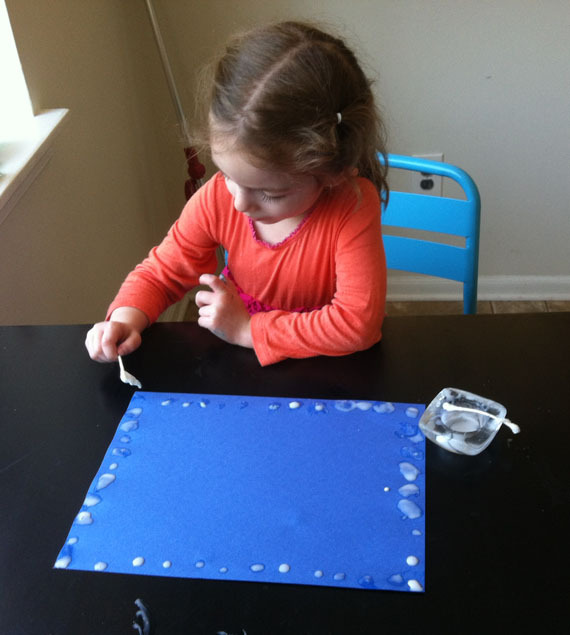 Addie put glue on both sides of her paper and then wanted to use the glue to hang paper on the wall. She is so funny! After I chased her down and took her wet glue paper, we went outside. We used rocks to hold the paper in place. Then they sprinkled the glitter onto the glue. As you can imagine they loved this part. 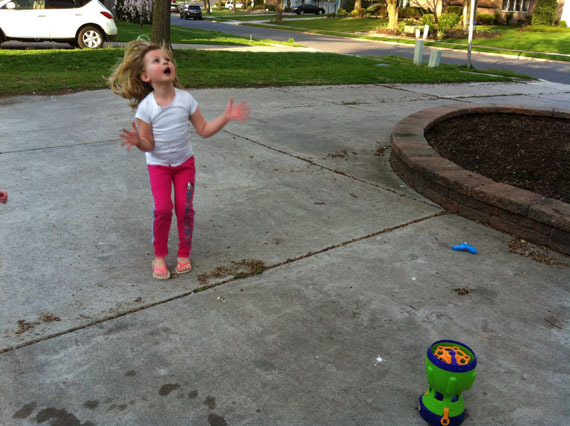 I went inside to get Addie more glue and I came back out and Maya was tossing handfuls of glitter into the wind. Needless to say, I may need to revisit the whole let's-not-be-wasteful-and-preserve-the-earth discussion that we all just had. When we finished we were all covered in glitter, but it was so much fun! 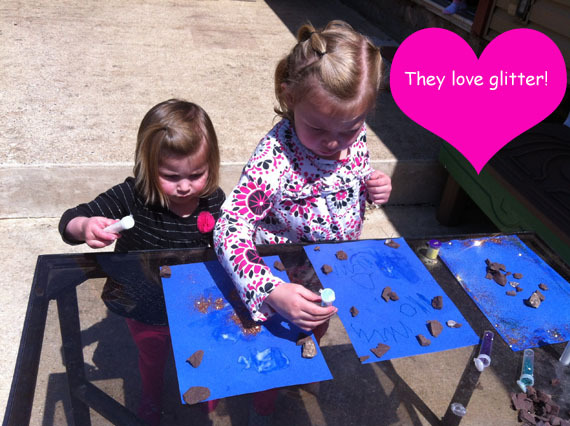 After they dried we glued the earth (coffee filters) to the piece of construction paper. Here is Earth and its sparkling stars. 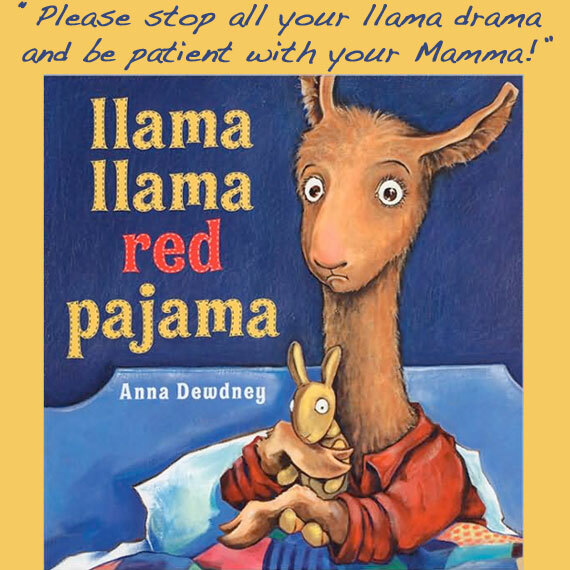 Have you read the Llama Llama books by Anna Dewdney with your kids? I love them; they are short enough to keep kids attention but long enough to have a story. I discovered them when Maya was about three and a half at the library and quickly knew that they were keepers! I love the rhyming and I can totally relate to the books. You'll understand if you read them! We just started reading them to Simon and he's obsessed! He requests "Wamma Wamma" every night before bed and he sleeps with his "Wamma Wamma" stuffed animal every night. Simon: [Laughing] Mama, Wamma Wamma poopy. 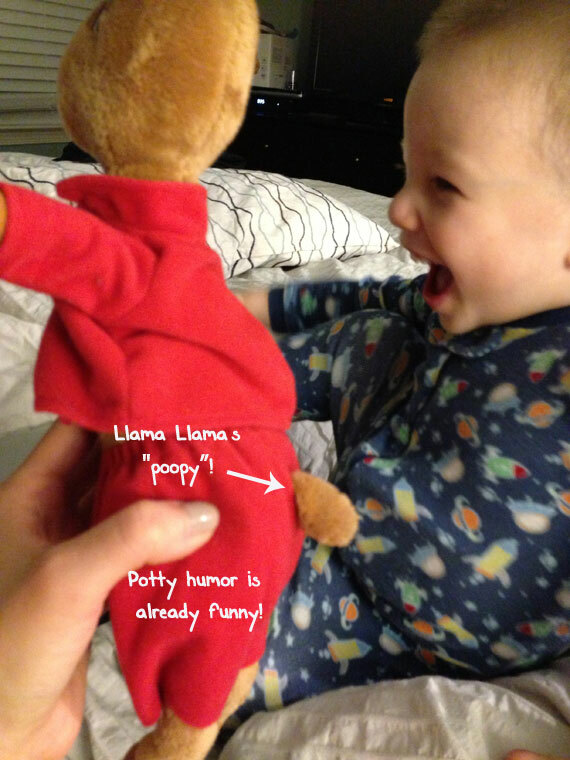 Simon: [Pointing at Llama Llama's tail] He make poopy! Me: [Trying to contain my laughter] And where should he make poopy? Simon: Wamma Wamma make poopy on the potty! At this point we were hysterical, I could totally see how why he thought that his tail was a poop! He was studying it intently trying to figure out why it was there and what it was coming from. Think about it, this child thinks now we own a doll with poop coming out, I'd be confused too! The other day I when I made Strawberry Shortcake Cupcakes I had a ton of extra Whipped Cream Frosting that I couldn't let go the waste. I also had some strawberries so I decided to stuff them with the frosting and the result was fabulous! First I hollowed out the strawberries. Then I piped icing into each of the strawberries. Anna and Addie loved them and were eating them as quick as I could make them. They tasted like tiny bites of cheesecake because of the cream cheese that was in the frosting, YUM! So here's the deal. I have NINE more projects to complete with seventeen under my belt. Most of the projects that are left are small, and no one sees, like cleaning my night table drawers, straightening the attic and so on. I'm losing my motivation and really want to get it back! On the other hand the projects that have been done are staying that way and one thing that is motivating me to keep the house clean is the clutter free floors that I can run my team of robotic cleaning machines. Like Mandi I am a big fan of the Mint, however, unlike Mandi we don't have dogs to pick up the big crumbs so I have to sweep before it works its magic. Instead of investing in a herd of dogs we got the Neato. It's an electronic vacuum that cleans the whole floor (as in the entire downstairs or upstairs). It uses an infrared "eye" to scan the room and map it out so it doesn't miss a spot. It moves back and forth throughout the room until it is finished and them moves onto the next one! If you want to block it off into a room it uses magnetic strips you put on the floor and it senses them and does not move past them. My kids and their friends find it fascinating and watch it working in our sun room. They even set up chairs to watch. It captivates them; it's funny to watch them watching a vacuum! One of my favorite features of the Neato is it's ability to sense when the battery is getting low, find it's base, charge and finish its job. We set it and forget it, just like a crock pot. It's great, the Neato gets turned on at night and in the morning we wake up to clean floors! We recently upgraded to the Neato Pet and Allergy Upgrade Kit. It has made the unit quieter and it is picking up a lot more dirt and cat hair! My husband ordered the upgrade and, I admit, I was not sure it would make a difference but it really has! I have a silly secret; our cleaning appliances have names. We got the Mint first and called it Rosey after the robot maid from the Jetsons. 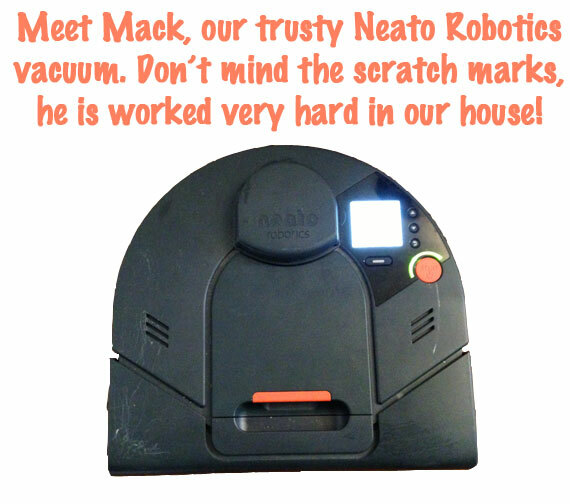 When we got the Neato we also needed to name it and, as a big fan of the Jetsons as a kid, remembered that Rosey had a boyfriend in an episode, Mack. 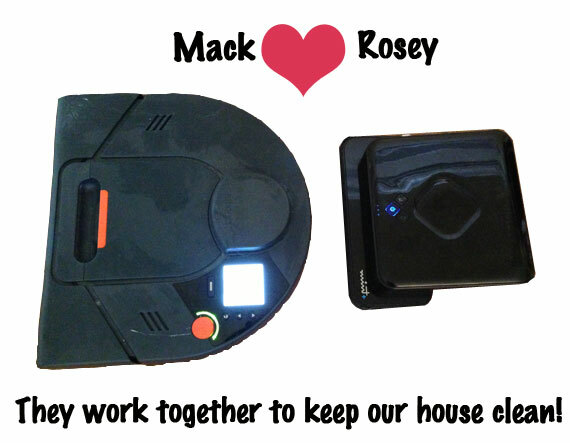 Now Rosey and Mack work together to clean our house! I know, I know: I love running, cleaning, organizing (and don't forget baking), and yes I am super annoying! I would run everyday if I could. It is a great way for me to clear my head, relieve stress, and keep my sanity while raising three kids. I am a much better (more patient) mom when I exercise. What on earth do you do with the copious amount of artwork that your kids make and/or bring home from school? Maybe I don't want to admit it but a lot of it might possibly go into the garbage the special filing bin in the kitchen. I do have a hard time tossing out artwork but the amount that Maya draws we would be living in piles of rainbows and hearts. I do find some gems and stash them on a shelf in our extra bedroom or on the bookshelf in her room. 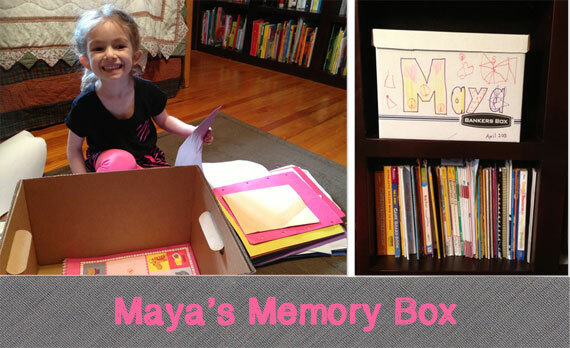 In my organizing craziness I came up with an idea to have Maya make her own box to store the artwork and mementos we save. 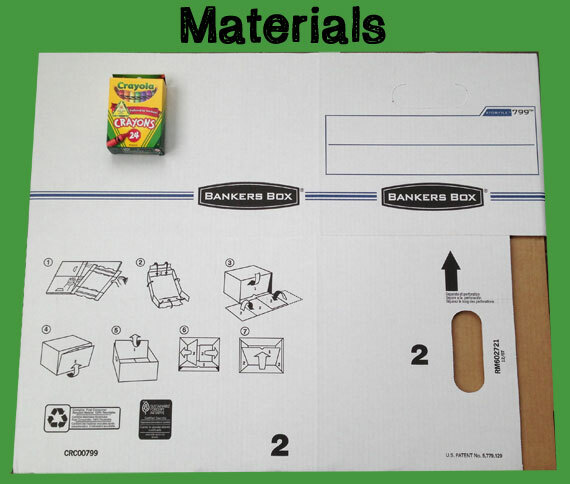 I got bankers boxes and a brand new box of crayons and Maya set out to work! Simon was napping so the two of us sat in the sunroom while I folded laundry and she decorated her memory box and we had some good old "Mommy and Maya Time". Since the box is made of cardboard it was bending while Maya was coloring. 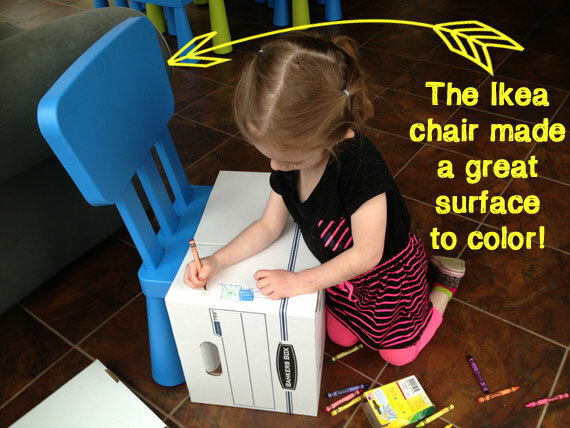 Turns out that it was exactly the right size to put our ikea kids chair inside to use as a coloring surface! 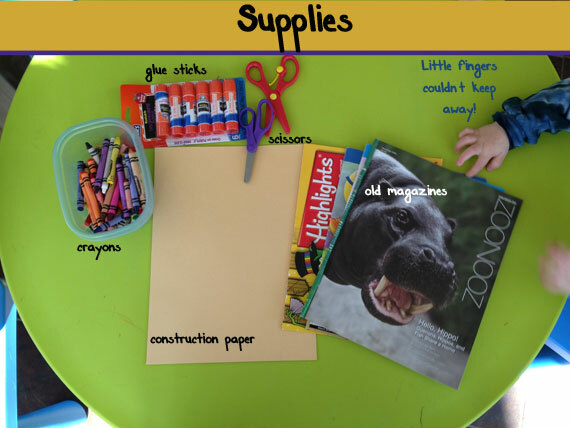 When Maya was finished we head upstairs and collected the items to save. We had fun looking back at the letters she dictated, drawings she made and other things we had saved. It was a beautiful day here, so we decided to get out Anna's new bubble maker that she received as a birthday present from one of her classmates. It was SO MUCH FUN! Seriously, I never really understood what these were all about. I thought that it was a lazy way of blowing bubbles. There was nothing lazy about this bubble maker. 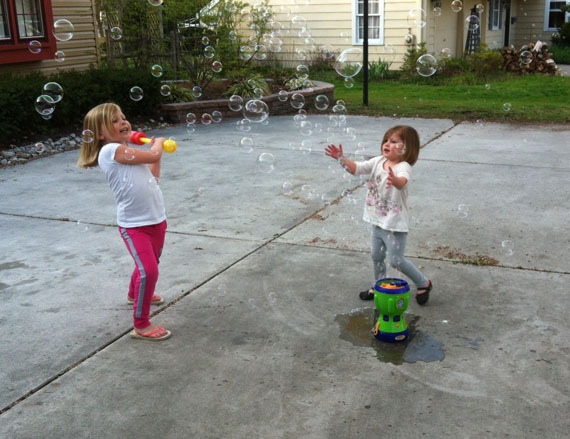 Anna and Addie spent an hour and a half running around the driveway popping bubbles. Anna was yelling the entire time "this is awesome, this is the best present ever." Addie was so focused on popping bubbles she would chase them everywhere. Once she almost ran into the side of the neighbor's house. Luckily the wind did not take the bubbles toward the street! They really loved this activity and it was great exercise! Not to mention their work on eye-hand coordination. The Gazillion Bubble Maker is no short of amazing. It spews out tons and tons of bubbles of all shapes and sizes. They mostly clapped the bubbles with their hands to pop them. But then Anna got out her water gun and used it like a bat. It came filled up with bubbles which was awesome. However they didn't last long. It said not to use other bubble brands. I did not follow this reccomendation and it seemed to work just fine. The only negative thing that I could say was that it took eight AA batteries that were not included. Luckily we actually had enough. The batteries did last at least two uses (about two and a half hours). They may possibly last longer than that, but we have only used it twice.